﻿ December is around the corner, and you’re probably thinking about the holidays. I’ve already re-written my list twice, adding in some more inexpensive AND more meaningful gifts, trying to bridge the difference between what I know my friends and family would love and my budget. 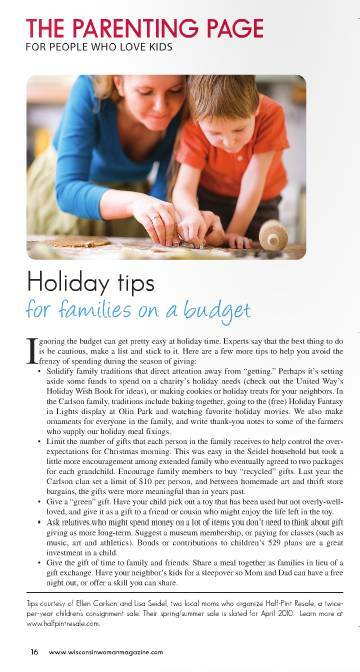 If you happen to get your hands on a copy of this month’s Wisconsin Woman, flip to page 16 and you’ll find our most recent article on a thrifty holidays. Don’t want to wait that long? The article is posted below. Feel free to leave your ideas for a thrifty holidays! We’ll be posting links in the next few weeks that can help you create more meaning of the days ahead. The holidays are a time when it becomes very easy to completely ignore the budget. Experts will tell you that the best thing to do is to be cautious, make a list and stick to it, and try and not get lured in by the frenzy of spending.. We have a few more tips that will help you focus on what’s most important this holiday season. – This is the year to invest time solidifying family traditions that direct attention away from the typical kid-focus on “getting”. Perhaps it’s setting aside some funds to spend on a charity’s Holiday needs (check out the United Way’s Holiday Wish Book for ideas), or making cookies or holiday treats for your neighbors. In the Carlson family, traditions include baking together, going to the (free) Holiday Fantasy in Lights display at Olin Park and watching favorite holiday movies. We also make ornaments for everyone in the family, and write thank you notes to some of the farmers that supplied our holiday meal fixings. – Limit the number of gifts that each person in the family gets, to help control the over-expectations of what Christmas morning should mean. This was easy in the Seidel household but took a little more encouraging for extended family who eventually agreed to 2 packages to open for each grandchild. Encourage family members to buy “recycled” gifts. Last year the Carson Clan set a limit of $10 per person, and between homemade art and thrift store bargains, the gifts were more meaningful than in years past. – Give a “green” gift. Have your child pick out a toy that has been used but not overly-well-loved, and give it as a gift for a friend or cousin who might enjoy the life left in the toy. – Ask relatives who might spend money on a lot of items you don’t need, to think about gift giving as more long-term. Suggest a museum membership, or paying for classes (such as music, art, and athletics). Bonds or contributions to children’s 529 plans are a great investment in a child. – Give the “gift of time” to family and friends. Share a meal together as families in lieu of a gift exchange. Have your neighbors kids over for a sleepover so mom and dad can have a free night out, or offer a skill you can share. We would rather have someone offer to help us salvage our kids terribly-stained clothing than recieve another holiday candle!